ARCADIA, Calif. – As he watched the horses run away from the gate in Saturday’s Breeders’ Cup Juvenile, trainer Mark Casse said he couldn’t find his horse. 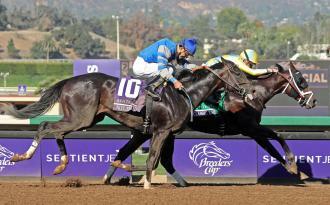 Classic Empire and jockey Julien Leparoux hold on to beat Not This Time in the Breeders' Cup Juvenile on Saturday. “Did he come out?” wondered Casse, who was not looking toward the front of the 11-horse field. Indeed, Classic Empire came out running and put himself right into the race in the early stages of the Juvenile. After stalking Syndergaard for nearly six furlongs, Classic Empire took the lead midway on the far turn, opened up a clear advantage turning for home, then held off a late bid from Not This Time to win the $2 million Breeders’ Cup Juvenile by a neck at Santa Anita. It was 7 1/2 lengths farther back to Practical Joke in third. He was followed by Lookin At Lee, Syndergaard, Three Rules, Gormley, Klimt, Term of Art, Theory, and Star Empire. The win was the fourth from five starts for Classic Empire and most likely cemented him as 2-year-old male champion. Twenty-four of the previous 32 Juvenile winners were crowned champion, and Classic Empire’s résumé includes victories in the Grade 1 Breeders’ Futurity and Grade 3 Bashford Manor. Classic Empire’s only loss was basically a nonstart. He wheeled at the start of the Grade 1 Hopeful at Saratoga, unseating jockey Irad Ortiz Jr., and basically ran off for 10 yards. He was uninjured. It was after that race that Casse put blinkers on Classic Empire. He won the Breeders’ Futurity at Keeneland leading up to the Juvenile. When Casse looked at the field for the Juvenile, he anticipated there being three or four speed horses whom Classic Empire would stalk. He didn’t anticipate being a half-length off Syndergaard through a quarter in 23.05 seconds and a half-mile in 46.60. Neither did winning rider Julien Leparoux. Classic Empire took the lead just before they ran six furlongs, which was timed in 1:10.48. Classic Empire opened up, and Casse thought Classic Empire was going to win by three or four lengths. But Not This Time, the 5-2 favorite coming off an 8 3/4-length victory in the Iroquois Stakes, had advanced from sixth to third and was on the move under Robby Albarado. Not This Time kept grinding away but could not catch Classic Empire. Classic Empire, a son of Pioneerof the Nile – the same sire as 2015 Triple Crown winner American Pharoah – covered 1 1/16 miles in 1:42.60 and returned $11 as the second choice. He is owned by John Oxley, who purchased Classic Empire for $475,000 at the Keeneland yearling sale. Oxley campaigned 2001 Kentucky Derby winner Monarchos, who died two weeks ago due to complications from surgery to repair a ruptured intestine. Trainer Dale Romans had been touting Not This Time as potentially the best horse he’s ever trained. But Not This Time isn’t all there yet mentally, according to Albarado. “It’s going to be a fun spring,” Romans said.